DC Modern Quilt Guild has a skill building Quilt Along going on right now. Anna from Life Sew Crafty has challenged us with a weekly quilt block. Anyone can join in this fun challenge! Go to Anna’s blog or join this Facebook group. Blocks 1 thru 5 are pretty straight forward. Block 6, however, is one of several “theme” blocks the quilt will contain. I chose a “flying geese” theme and found this trail of geese block from Daniel of Piece and Press. It is a foundation pieced block and he says in his post that he used a freezer paper technique to sew it. I had some freezer paper sheets that are sized for printing. 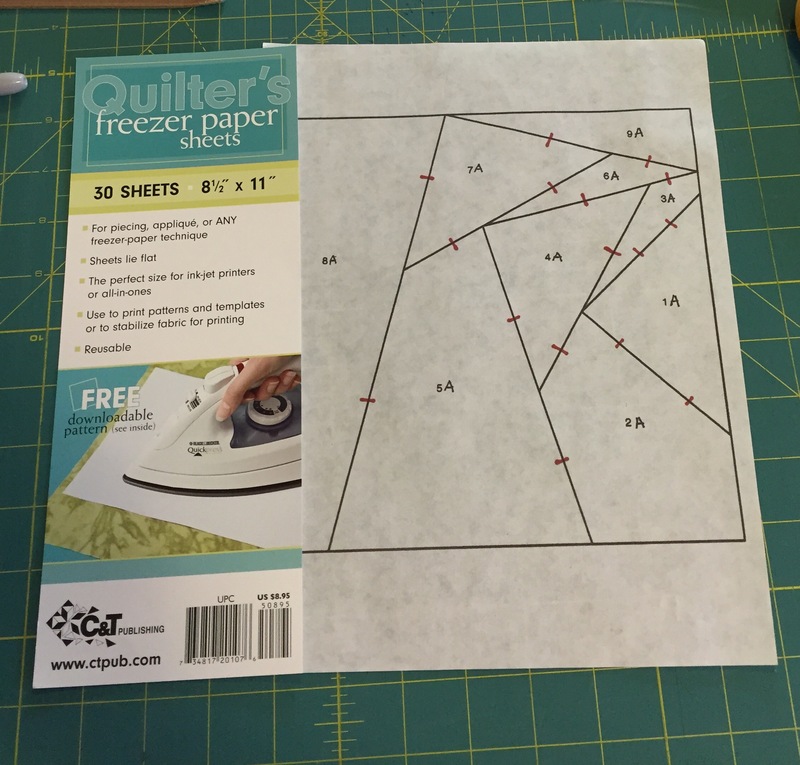 After resizing the block to fit the size I needed for the QAL quilt, I printed it onto the freezer paper sheets and made two red registration marks between each piece. This block only has 9 pieces which I think made it especially suitable for this technique. *The complete trail of geese block contains 6 of these individual blocks – 3 of which are mirror image. 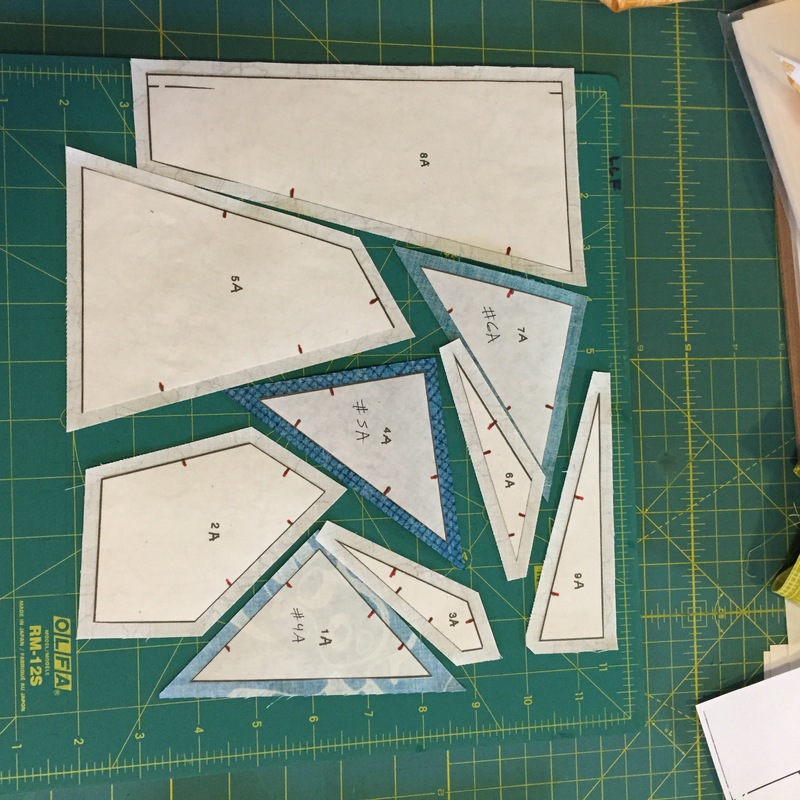 Each template piece was cut out and ironed onto the wrong side of it’s corresponding fabric and then the fabric was cut 1/4″ larger than the template. In this block six of the pieces are background and three are the geese. I numbered the geese (and my fabric) 1 thru 18 in order to have the geese end up in the color order I wanted. They were arranged back into their block positions and then sewn together in order – the registration marks made it very easy! I placed right sides together and sewed along the paper edge – not through it. Once done, the paper was simply and easily peeled away. This is so much easier than removing paper from stitching. I’m not sure this technique would work for a more complicated foundation pieced block, but it sure was great for this one! 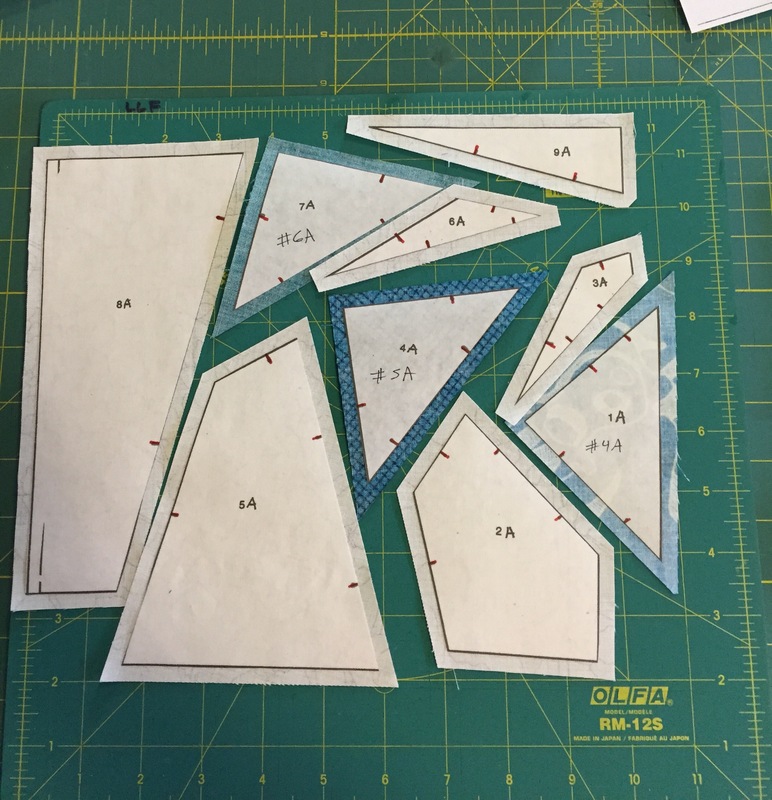 There is a great round-up of foundation piecing tutorials by VeryKerryBerry here. 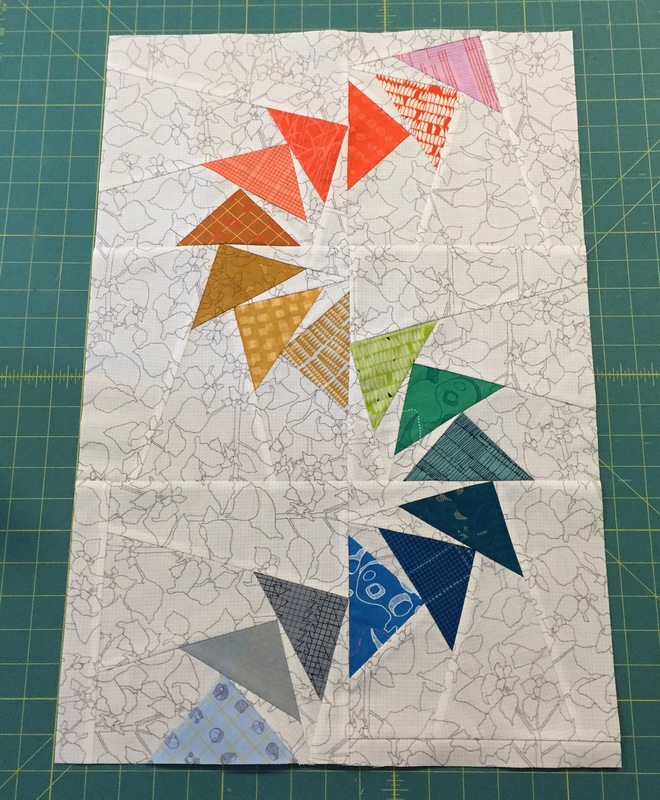 This was a fun block to sew and I look forward to the upcoming theme blocks during this Quilt Along. I’ve never loved the process of foundation piecing, but this looks more appealing to me than most methods, since there’s not all that ripping at the end. 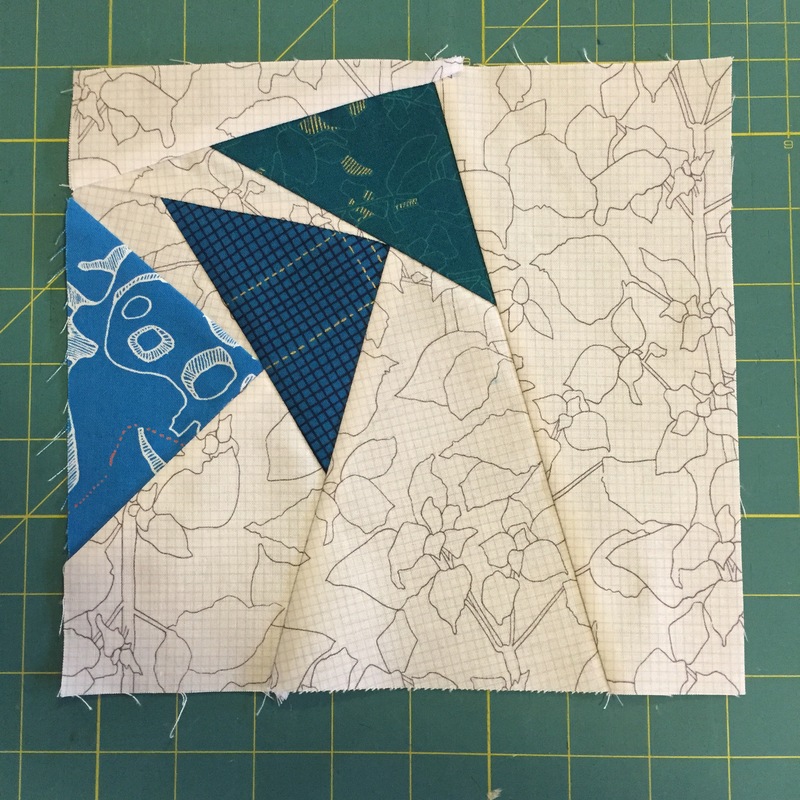 There are certainly some fabulous blocks to be made using foundation piecing! Love your curvy rainbow geese! This is genius. I’ve always hesitated to put freezer paper in the printer for fear of melting…. I am new to quilting and find myself enchanted with foundation piecing. I have a brand new bundle of a rainbow of fat quarters which came with a really pretty color wheel pattern. When I saw these geese I immediately planned a companion piece using the color wheel progression of fabrics. This will be such fun!